For a professional edge with a keen polish when hand-sharpening knives and tools, turn to Lansky's Hard Arkansas Stone. 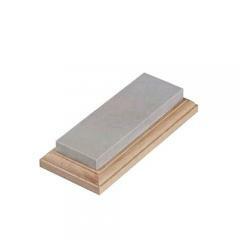 Used as a whetstone since the early 1800s, this hard natural stone has been used to sharpen knife blades and tools with metal edges since it removes less metal than man-made counterparts. The result is a well-honed, fine edge with a polished finish. The stone comes in a green plastic base with a non-slip rubberized bottom for practical bench use. When the stone is not in use, the green base doubles as a protective case safeguarding the stone's finish. Ideal for sharpening a wide assortment of tools--from pocket and kitchen knives to carving utensils and wood planers--the Lansky Hard Arkansas Stone meets the versatile needs of craftsmen and do-it-yourselfers.